My alarm woke me up from a deep slumber at our room at The Manor. Tonight’s accommodation is somewhere in Alaminos, Pangasinan. Today started out relatively late at 7:30am. We were actually supposed to be waiting at the lobby already, but everybody seemed to have enjoyed their sleep last night, so by 7:30, we were just checking out and having breakfast. 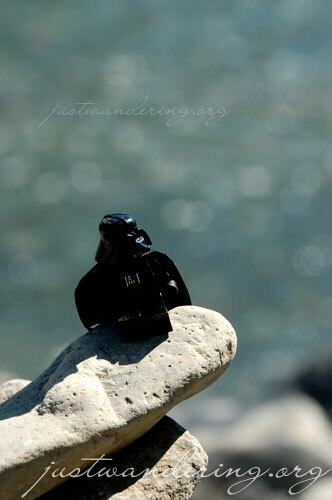 Darth Vader pondering the life and times at the Empire by the Ambuklao River. And why his clone army has a very short life span. There was a press briefing at the Baguio Country Club. 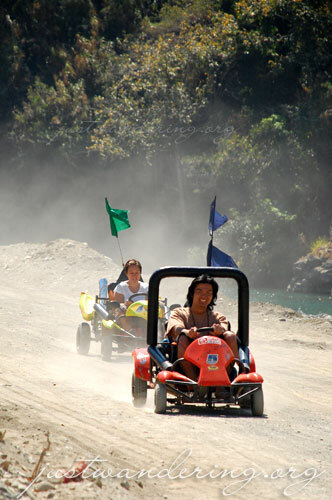 Baguio is taking a different route for promoting tourism in their region: adventure travel. It’s not exactly what you would expect from Baguio, a place known for its temperate climate, fresh produce and ukay-ukay shopping. We were introduced to the Ambuklao Dam and River, where activities like kayaking, river boarding, karting, mountain biking, rappeling, snorkeling and even SCUBA diving is possible. A mere 45-minute drive from the City of Pines, this is a great day trip and an alternative to the usual Baguio itinerary. 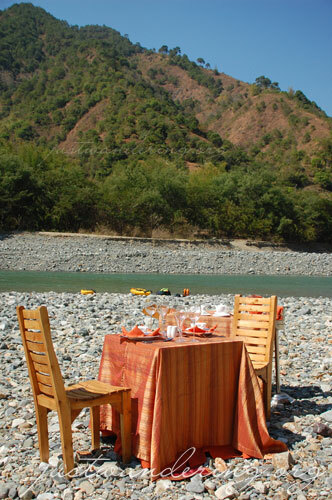 The Baguio Country Club takes it up a notch by offering a picnic service that lets you enjoy the outdoors in style. Picture this, you spend the day going through all sorts of adventure (or misadventure) in the dam, and with the last ounce of energy, you walk to a clearing where a nice picnic is waiting for you, complete with an outdoor bar that serves refreshing drinks, a chef to prepare the most sumptuous of meals and a butler to tend to your needs. Okay, that may seem a bit too pretentious especially right in the middle of a dry riverbed, but really, after an exhausting day, nothing beats a cool drink (the Baguio Mint was an instant hit) and some flavorful adobo served over a mound of white rice. Due to a problem with our shuttle, our schedule was thrown off the loop and we were terribly behind. It was already 5 o’clock when we left Baguio, when we should be doing our courtesy call at the Pangasinan Capitol at 5:30pm. We finally rolled into the capitol complex at 8 o’clock. We were given a mini tour of the complex, including a tour of the provincial capitol, where we had a very late snack of tupig, bangus fillet, dinuguan and puto. I’m writing this from inside the Lakbay Norte Victory Liner bus as we make our way to Alaminos. I’m heading straight to bed later; it’s another long day tomorrow. Hi! How much nagastos niyo for the whole trip? yung transpo, food, accommodation, and activities? Thank you po!